The Blacksmith Lapwing occurs commonly from Kenya through central Tanzania to southern and southwestern Africa. The vernacular name derives from the repeated metallic ‘tink, tink, tink’ alarm call, which suggests a blacksmith’s hammer striking an anvil. The hippopotamus is semi-aquatic, inhabiting rivers, lakes and mangrove swamps, where territorial bulls preside over a stretch of river and groups of five to 30 females and young. During the day, they remain cool by staying in the water or mud; reproduction and childbirth both occur in water. They emerge at dusk to graze on grasses. While hippopotamuses rest near each other in the water, grazing is a solitary activity and hippos are not territorial on land. The hippopotamus is one of the most aggressive and unpredictable creatures in the world and, as such, ranks among the most dangerous animals in Africa. Nevertheless, they are still threatened by habitat loss and poaching for their meat and ivory canine teeth. These two very different sized species live in harmony. The hippo provides a very safe resting place for the plover while the plover in turn helps keep the hippo’s eyes and ears clear of insects. 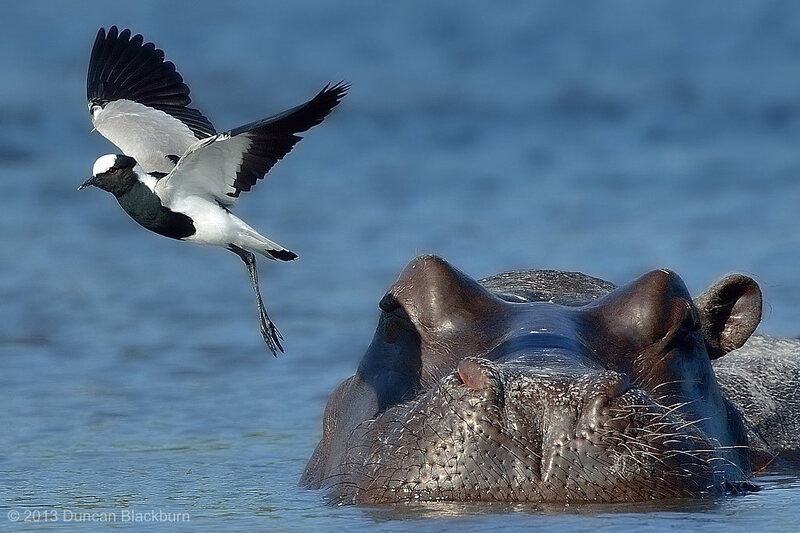 Note how the hippo has folded his right ear to ease the plover’s take-off! Isn’t nature wonderful?